This project focuses on Acanthus plant which well used as an ornament but being neglected of the actual plant. The idea of Garden Acanthus, White Acanthus is got from the white Acanthus plaster moulds in the Mecum’s collections (in Marseille). Those moulds were casted from old furniture in the Mediterranean region. 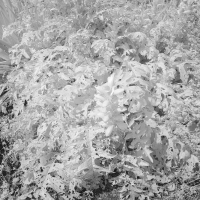 Garden Acanthus are a series of Infrared Black and White photographs of varies Acanthus plants captured from different Botanical gardens. 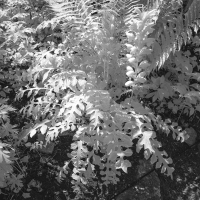 With the characteristic of IR photography, the colour of the acanthus leaves becomes pale white. White Acanthus is porcelain piece with the leaf form casted from the Acanthus plants which grew close to Mucem. Both of the works are particularly removed the originally colour of the leaves like the Acanthus motif but they still capturing the reality of the leaves shape. All the works will be placed in a darkroom with green spotlights, they all seem green but all are actually a projecting colour. The first stage of this project was shown in ACC, Gwangju in collaborating with MuCEM, Marseille. Acanthus Medallion is the second stage of the Acanthus project. Acanthus ornament was travelled to and applied in South Asia in different period of time and different contexts. I choose ceiling medallion as it is still an option for interior decoration in Bangladesh. It is strongly connected to the Victorian Architecture style, but they are being modified with the colour of local culture. Acanthus mollis is not a native plant in South Asia, not many people know about the plant but maybe only the “leaf pattern from another countries". With the casted white porcelain acanthus leaves placed on the medallion, the discoloured leaf provides a new layer of information to the audiences about the actual identity of the plant. White Tower is the working stage of Acanthus medallion showing those objects from different backgrounds interacting with each other. White plaster medallions are arranged in a column and separated with cotton wrapped lumbers. The third stage will be launched in 2020.